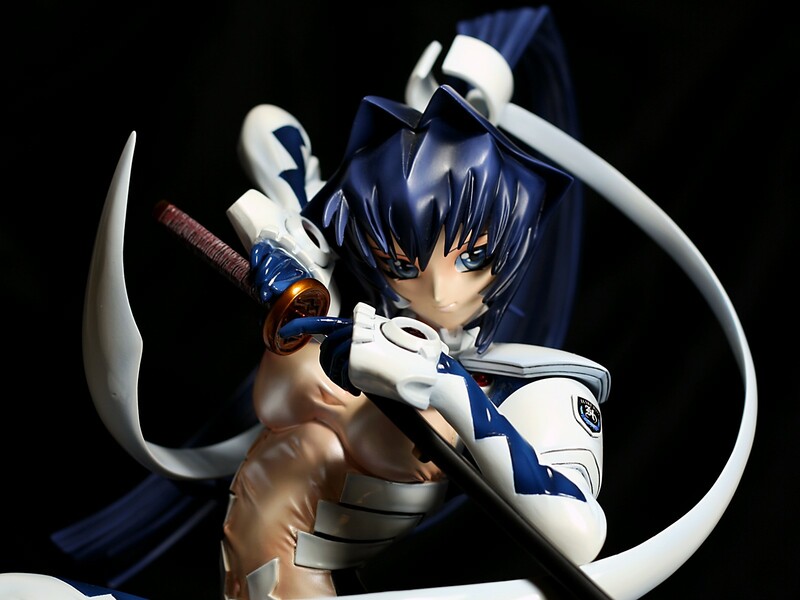 Meiya Mitsurugi is one of the characters from Muv-Luv, an ero game and anime property that I don’t know much about. 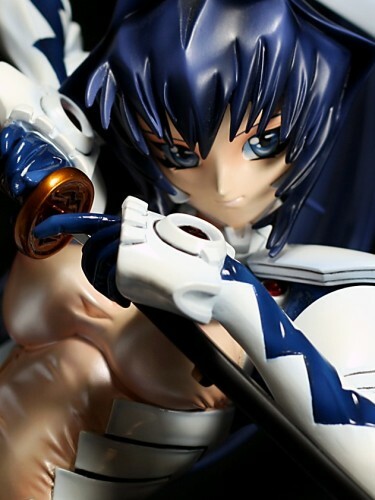 This figure represents her as she appears in Muv-Luv Unlimited, which seems to be a game that locks young women in tight outfits in perilous combat with a host of aliens. 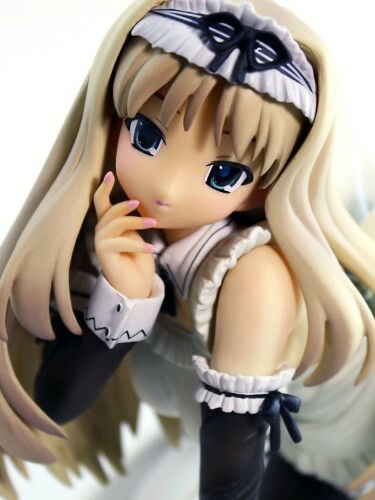 Originally designed by Volks, I purchased this figure as a prepainted resin figure from Hobbyfan. I like Meiya’s character design and the fact that this figure was discounted was a nice sweetener. Haruka Takamori is the protagonist of Beat Blades Haruka, an erogame made by Alicesoft (NSFW). I played through part of the game, and under my direction poor Haruka often ended up being explored and abused in ghastly ways. No doubt my lack of comprehension of both Japanese and the game’s mechanics contributed to her inferior battle performance. 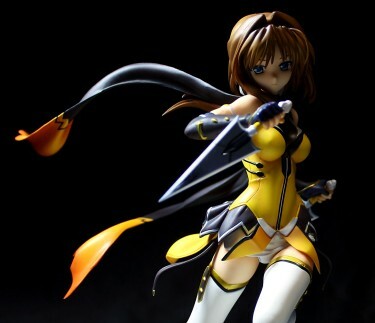 Beat Blades Haruka has very nice artwork, but I was hesitant to pick this figure up because I thought the face didn’t look entirely accurate to the game graphics. Fourteen hours into Star Ocean: The Last Hope, I think I can declare that Edge Maverick is the most pathetically naive main character of any Japanese RPG I’ve played. I’ve played a lot of them, but if there is one that features an idiot of greater magnitude, my memory fails me. Apart from that, the game is somewhat enjoyable. Edge and his merry band of sycophantic invertebrates have some appealing characteristics and the story and setting remain engaging. Actually, do you know what Star Ocean reminds me of? It reminds me of the book Angels & Demons. I read all the way through Angels & Demons despite thinking it was the most ludicrously contrived piece of crap I’d ever read, and while I don’t feel nearly that level of antipathy towards Star Ocean (perhaps because the latter has a cute half-naked loli catgirl and the book does not), I still have to suppress myself from rolling my eyes during each cutscene. I will play on and see if any of the characters grow a backbone and some testicles. Another character from the acclaimed erogame Sengoku Rance, Nanjyou Ran appears to be one of the game’s principal female love interests. This particular figure is in a solid 1/6 scale and was designed and sculpted by Volks. 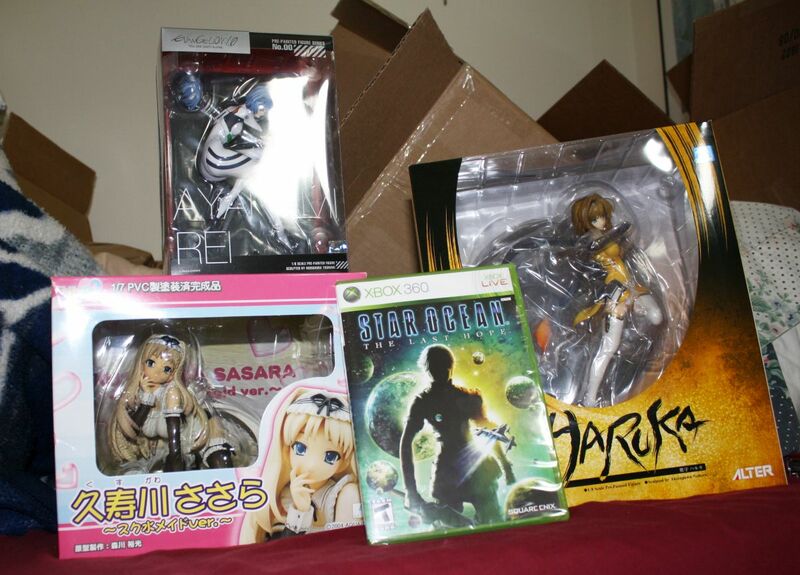 I got new stuff today. I’m hoping Star Ocean is as good as Tales of Vesperia, but I have this feeling that I’m going to be disappointed. I got this figure about a year ago from E2046. The original garage kit was designed and sold by Volks, and this figure is a prepainted, pre-assembled resin kit, 1/6 scale in stature. I felt a little bit of trepidation before buying it as the price tag was near twice what I’d pay for a PVC figure from Alter or GSC or anyone, and I definitely had no assurances regarding the quality control of a Hong Kong-based recast company.